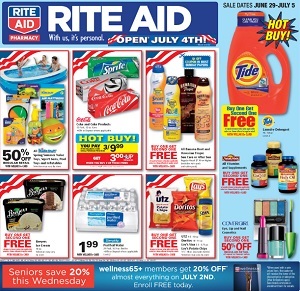 This week Rite Aid weekly ad circulars, store flyer, deals and specials. Save with the Rite Aid store circular featuring the best discounts and promotions on grocery & beauty products and more. Check for great savings on: Kids Stuff Spring/Summer Value Toys; Breyers Ice Cream; Banana Boat and Hawaiian Tropic Sun Care; UTZ, Doritos, Lay’s Stax or Lay’s Potato Chips; COVERGIRL Eye, Lip and Nail Cosmetics; Tide Laundry Detergent; Hershey’s, Reese’s, Mars, M&M’s or Nestle Big Bags; Whitman’s Sampler, Hershey’s Pot of Gold or Russell Stover Boxed Candy; Lindt, Ghirardelli or Toblerone Candy Bars; Planters Mixed Nuts or Cashew Halves; Frank’s RedHot Sauce or Heinz Ketchup; Port Clyde Sardines or Bumble Bee Chunk Light Tuna; Keebler Club or Town House Crackers; L’ORÉAL Studio Stylers, VO5 Hair Spray; L’ORÉAL Advanced Hair Care Shampoo or Conditioner; Neutrogena Cosmetics; Men’s or Women’s Summer Footwear; Patio and Beach Umbrellas and PE Gazebo; Sunbeam 5000 BTU Window Air Conditioner; Cascade Automatic Dishwashing Detergent; and more. Rite Aid is one of the nation’s leading drugstore chains, with approximately 4,600 stores in 31 states and the District of Columbia. The company has a strong presence on the East Coast and is the third-largest in the United States, employing roughly 89,000 associates.